United Party for National Development ( UPND) President Hakainde Hichilema has disclosed that he was brutalised by heavily armed state police while picking him and 5 others from Chimbokaila prison to Mukobeko Maximum prison yesterday. Mr. Hichilema said he was bundled like a bandit even when he did not object to the heavily armed state police’s action of transferring him to Mukobeko Maximum prison in Kabwe’s Central Province. He says it is unfortunate that he is being ill-treated when he is not a criminal. Mr. Hichilema has since called on the country to remain strong as his vision for a better Zambia is not broken. He says he remains unshaken even when State Police continue humiliating and torturing him and called on the country to remain strong and demand for real democracy anchored on respect for freedom of association and assembly as well as fundamental principles of respect for human rights. And the UPND President has said that as at last night he was thrown into a cell that was heavily congested but that he enjoyed the company of inmates who have continued calling on him to uphold democracy, develop the country once he forms government. He however says what is more worrying in prison cells is the congestion and a high likelihood of contracting diseases. 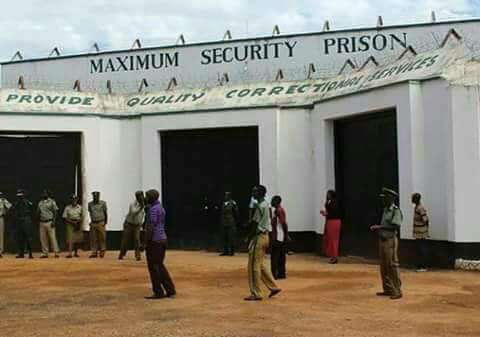 Mr. Hichilema said once in government he will work round the clock to ensure that prisons are made better places as even condemned inmates are equally human beings that deserve better treatment. Meanwhile, the UPND President says he is ready to give up his life if that is what it meant to fight for democracy and economic development for the country. He said Zambia’s democracy has regressed in the recent past, but the country must sacrifice along with him in order to restore it. UPND President Hakainde Hichilema and 5 others who have been slapped with treason charges were yesterday moved by heavily armed state security using a chopper from Zambia’s capital city in Lusaka’s Chimbokaila prison to the Central Zambia, Mukobeko maximum prison. This was done without any court authorisation as earlier on Lusaka Magistrate Greenwell Malumani had ordered the state keep Mr. Hichilema in Lusaka Province. Meanwhile, hundreds of people are making their way to Central Zambia to go and visit the UPND President whose High Court appearance for trial is not yet known, though Lusaka High Court judge Judy Mung’omba has set Monday as a day for the application to have the treason charge quashed on grounds that Hichilema did not commit any offence. its really a shame. I didn’t think this government “our government “can go to that extend. Me too. It is unbeleavable that our brothers still support PF leadership which has failed to honour its promise of being a pro-poor party and reduce their poverty. Instead PF had directed its anger and energy on HH, who has every thing he needs for his life. I am so disappointed that the little freedom left by bataata Sata is now gone. I wander what is there to support our PF leaders for. We want freedom left by galant leaders like Chiluba, Mwanawasa and Ruppiah Banda. My heart is brocken. “HH said Zambia’s democracy has regressed in the recent past, but the country must sacrifice along with him in order to restore it”. Very touching. Lungu needs a lot of help, unfortunately he does not seem to have people that can look him in the eye and take him (Lungu) thru what humanity entails. We don’t` live forever, our positions should be used to serve humanity and not to persecute people. This is basic principle of life. Edgar Chakolwa Lungu is a thug, a criminal and murderer who is not worthy to be president. He is a Devil and a christian only by false pretence yet his heart is full of blood and bones of dead people whom he killed at his command including those he is still pursuing in order to kill. Peace loving Zambians should stand up and rise against this tyranny. Things will not be the same Pf will not be in power forever. Its just a matter of time Edgar,Police IG,Intelligent Chief,Zambia Army,ZAF and those that the ZAMBIANS know are behind all these activities surrounding HH’s arrest and mistreatments will one day also regret.Lungu should remember that he will not be president forever as just like his officers he is using to abuse their positions will equally come to an end.We have had UNIP,MMD its now PF next it will be another party and Govt in power so as the adage says ICILIPAMUNOBE ECILIPALI he ought to be very care because for him and his minions it will be worse. This is a good lesson for a every zambian who does not respect the rule of law.its good to think before you act. If hh knew that it would have come to this he would have not behaved like what he did in mongu.whose freedom he is fighting for?, ,apart from him fighting to be a president. In zambia we elect who is to be a president for a certain period. We have seen politicians with the visions for the country but not him and furthermore mango taipila pamo.power is sweet and we have seen great politicians varnish without living any empact. HH will be guity and he will never have the chance to stand a chance to be the president. He has regretted much but nothing can be changed. I feel for the wife with this cold weather. After calling them Dogs and mother faker what did you expect? You will surely receive the full force. I wonder why you blame Edgar. God is a just God. He analyses thoroughly the matter. If you had called me dog I would have beaten the hell out of you.